I love the "don't shoot the messenger" posts Lisa Trosien has had recently. Check them out here: Dear Onsite Staffer & Dear Mr. (or Ms.) Property Management Exec. All excellent examples for why teams don't progress and move forward. Unfortunately, we all have different expectations of each other, but it's how we manage those expectations that affect the game in my opinion. Most people have a tendency to settle and point fingers. Either direction, this just isn't fair. It's not fair to settle for an average boss that continues to just point out your shortfalls, and it's also not fair to settle for average employees that continue to just show up and coast. The lists Lisa shared just points out complaints against the average. It's time to kill average and not accept it anymore. We must do this not by complaining about average, but by overcoming average. You're not being fair to yourself if you don't. We all have our good days, and we all have our bad. I am not perfect, and I don't believe anyone is. I make a number of mistakes, but always strive to fix them. These are not excuses, but realities and challenges in overcoming average. I have my own shortfalls, and individually everyone else does as well. It's the choices we make to battle through those and no longer use them as excuses that push us above average. Yes, it's difficult to consistently strive for above average, let alone remarkable, but you could argue that the reason it's difficult is because failing is uncomfortable and scary. What I'm suggesting is that to be successful you don't have an option. Discomfort and fear are no longer excuses. Average in an economy like today gets you laid off, gets your bonuses cut, and could put you out of business. Flying below the radar is no longer possible. Everyone is under a microscope. Customer service jobs are even more so under the microscope and expectations continue to rise. Multifamily is no exception and we all know it. I get passionate about a number of things, but I believe we can all get passionate about being better people. It's your choice, it's your career. Are you going to change the game? Are you going to become a better student of the game? It's an individual choice. No one is going to make the choice for you or hold your hand and guide you through. I'm going to continue to make mistakes along the way striving for remarkable, and I hope you join me for the ride. 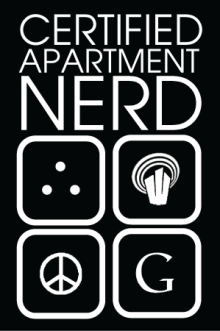 Thank you to those that have already joined the apartment nerd ride and have shared and continue to share the messages.